UBC’s Okanagan campus disposed of 100.65 kg of garbage per person in 2014. 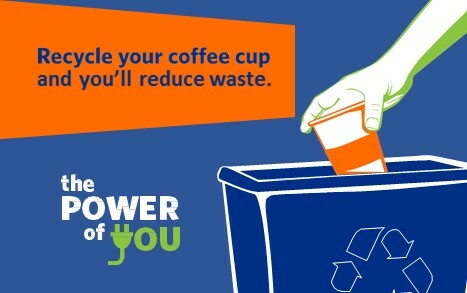 Of the garbage assessed during the 2014 bi-annual waste audit, 85 per cent was found to be recyclable and 20 per cent of that consisted of single-use coffee cups. If materials such as remnants of food or liquids are introduced into the recycling stream, recyclables end up in the garbage. Landfill garbage increases the risk of soil, water and air pollution, and creates the greenhouse gas methane (CH4). Methane’s impact on climate change is twenty-one times greater than carbon dioxide (C02). The original 3 R’s have expanded to 7. Please apply the following RE-rules to help improve campus waste diversion rate and reduce overall production of wastes. What was not recyclable last year might be recyclable now. Visit the campus’ A-Z Recyclepedia to learn about what is accepted in recycling streams at UBC’s Okanagan campus. Bigbelly solar compactors offer the campus a new opportunity to address waste management challenges. The systems upgrade traditional waste management infrastructure and are proven to reduce operational costs, improve recycling compliance, and decrease campus’ carbon footprint. Read more about the Bigbelly recycling and waste receptacles here. Stop and ask yourself “Is this really garbage?” before disposing of material in the garbage stream. Purchase items with the highest recyclable content, eg. paper containing 30% PCW or higher. Re-duce the amount of materials you purchase, use or throw away in a day. Bring as little potential waste items to campus as possible, following the principle: Carry Out what you Carried In. Read and send documents electronically, where possible. Use reusable containers and utensils for meals. Bring a reusable bottle for water; there is a WaterFillz kiosk in every academic building on campus where you can fill up with free, cooled, uv filtered water. Bring your own mug for coffee and receive a discount at food outlets on campus. Keep one-side printed non-confidential paper for the Rescued Paper Scratch Pad program. Place all refundable/returnable bottles and cans in the in the green refundable bins on campus. Refundables/returnables are processed by Pathways and all funds collected from returns are donated to Pathways Kelowna. Purchase items from a company that accepts all shipping and packaging material returns, ie. London Drugs’ Green Deal Program. Know the color code. Recycle accepted material in the correct bins on campus. Visit the Sorting Guide for more information on accepted items for recycling, returning and composting. Compost all accepted materials. Items include all vegetable and fruit waste, egg shells, and coffee grounds. Reduce the use of single-use disposable cups on campus and avoid the recycling stream all together. Did you know that you can save $0.50 – $2 a week, or $50-100 per year, just by using your own mug to campus for coffee? The campus Tim Hortons, Starbucks, GreenThread, HotSpot, Booster Juice/Extreme Pita and Sunshine Café offer an environmental discount to customers who use their own mugs. Per Person: faculty, staff and student FTE inclusive. Data calculated using Progressive Waste Services waste reports. Municipal Solid Waste and Greenhouse Gases. Government of Canada, Environment and Climate Change Canada. July 2014.